When kids are doing things that they like to do, like playing in their outdoor cubby house, they learn how to organize the thing they like to play with. For instance, if there is a certain teddy bear that takes its naps in a cubby house, you can bet your child will remember to bring that bear out with him every day – and back into the house when playtime is over. Being an organized person helps one to be successful. You can you can start to teach your children organizational skills when they are very young by using the things that are the most important to them – their toys! That includes their outdoor toys. Keeping their cubby house cubby picked up will help your child start their play new and fresh everyday. All dolls and teddy bears brought back inside. Outdoor toys brought into the cubby house. Your kids will develop a good habit which will spill over to other areas in their lives. It’s a win-win… and things are getting cleaned up! 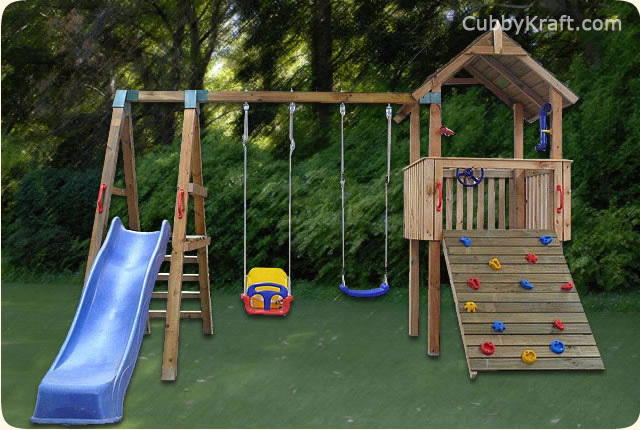 A perfect cubby fort design for those who want the place to grow with their children and help keep them physically fit. The rock wall, which comes with this design, will help your child build upper body strength and give them more choices of play areas as they grow. Read more about the Lion Cub Cubby Fort here.